The Creation Manifesto has been drawn up by the Biblical Creation Society in order to present systematically the consequences and implications of the account of the origin of the cosmos in Genesis. The purpose of the document is not to make an exhaustive statement about creation. It is rather to state what we consider to be the irreducible minimum that we can accept on the subject and continue to be faithful to the Word of God. Our prayer is that this Manifesto will be a valuable tool in fostering closer ties between Christians and in dialogue with those who differ from us. First published in 1988 in Origins, the journal of the BCS. Please use the Publication Order Form. 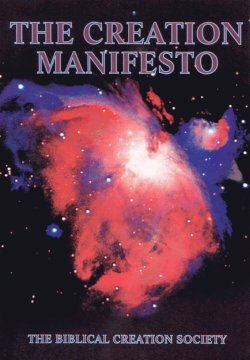 A popular rewrite of the Creation Manifesto appeared in the February 2001 issue of Origins (Number 27), authored by Mike Matthews. This article can be accessed from our web site.